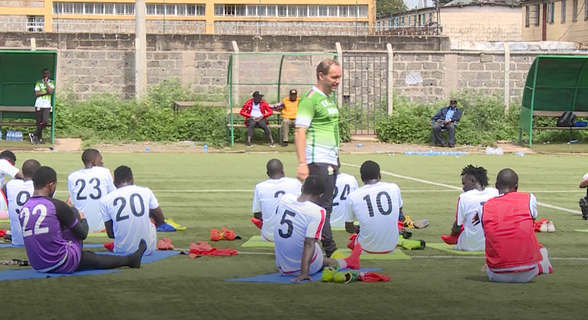 Coach Sebastien Migne has made only one change in his line-up to face Chinese Taipei from the one that lost 3-0 to India. The third Heroes Intercontinental Cup match fro stars will be staged at Mumbai Football Arena, Mumbai on Friday at 5:30pm Kenyan time. Eric 'Marcelo' Ouma who plies his trade in Albania will replace Bolton Omwenga in the starting eleven. Cliffton Miheso, Ovella Ochieng and Pistone Mutamba lead charges upfront with Patrick Matasi expected to stop the ball from crossing the goal posts. Kenya must beat Chinese Taipei by more than three goals to no reply to secure second spot since they will finish on six points, same as India and New Zealand. India lost 2-1 to New Zealand in their third match. India has a goal difference of +7, New Zealand has +1 while Kenya so far has -2. Harambee Stars Starting XI : Patrick Matasi (GK), Jockins Atudo, Eric Ouma, Mike Kibwage, Musa Mohammed, Dennis Odhiambo, Patilah Omotto, Duncan Otieno, Cliffton Miheso, Ovella Ochieng, Pistone Mutamba. Substitutes : Timothy Odhiambo (GK), Bolton Omwenga, Bernard Ochieng, Johnstone Omurwa, Vincent Wasambo, Chrispin Oduor, Kenneth Muguna, Timothy Otieno, John Makwatta.